Description/Field Marks: 11-13 inches tall; olive gray (or cinnamon-brownish color) with black spots on wings; head is small in proportion to body with a small black mark on the neck. Tail comes to a point with white spots which is indicative. Reddish legs. Overall, streamlined shape. Voice: Lament which sounds like “woo-OO-oo-oo-oo” or “perch-coo,” often “by unmated males from a conspicuous perch,” according to Cornell’s website. From a distance only the final three coo’s may be heard, according to Peterson, p. 208. Male/Female: “The male is slightly brighter than the female and has a powdery blue-gray area on his nape and a rosy sheen on the sides of his neck,” according to Forshaw et al.’s Birding, page 176. Juveniles, lacking neck patch, have scale and shorter tails. During breeding season, when you see them in flight, the lead bird is usually the male of a pair. Diet: Foraging on ground for grain or seeds, but they store seeds in their crop/craw and then move to a safe perch to digest it. Occasionally, they eat snails or insects. Mourning doves “eat roughly 12 to 20 percent of their body weight per day, or 71 calories on average,” according to Cornell website. Nesting: A shallow bowl in vegetation or on tree limbs. Eggs: Consists almost always of two eggs, which are incubated by male (during the day) and female (at night) for 14-15 days. Incubation: Two weeks. Squabs fledge about 11-15 days later. Behavior: “Lives and roosts in flocks;” most appear to mate for life; “surviving mates have been observed tending to their fallen mates,” according to the Dove Fact Sheet. May migration, or stay if supported by birdfeeders and birdbaths. Speedy flier up to 88 KPH or 55 MPH; their wings make a distinctive whoosh (or whistle) upon departure. Habitat/Local Sites: Almost anywhere except the deep woods; commonly perched on telephone wires or open areas. Range: Pretty much all over the U.S., wintering in Central America and breeding in southern Canada. They can fly 1,000 miles. Environmental Threats: Appear to be resilient to hunting; perhaps 70 million are killed annually. Did you know: These are the most hunted bird in the U.S.—weighing about four ounces, dressing out to about two? One dove was found with 17,200 bluegrass seeds in its crop. The oldest known mourning dove died at 31 years, 4 months. 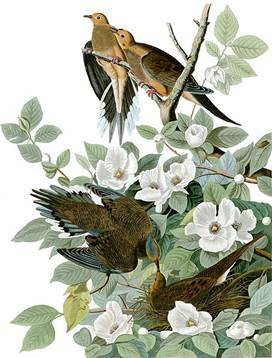 1) The Cornell Lab of Ornithology, “All about Birds: Mourning Dove” (accessed 26 March 2013). 2) “Mourning Dove” (accessed 26 March 2013). 3) “Mourning Dove” (accessed 26 March 2013). 4) “The Facts about Mourning Dove Hunting in Minnesota” (accessed 26 March 2013).